Delingpole: The EU Is the Mob. Never Get Involved with the Mob. Alexis Tsipras, the leader of the radical left Syriza party, had, you’ll recall, been elected on a wave of popular enthusiasm to tell the EU exactly where it could stick its austerity plan. Greece was withering and dying. One-third of its population was living in poverty. Many of its public employees had not been paid for months. Hospitals were running out of supplies. There was rioting in the streets. Sure, Greece had invited some of this with its profligacy and its grotesquely bloated public sector and its ludicrously unaffordable pensions. Yes, it’s true that in a less corrupt world, Goldman Sachs would never have been able to cook the books in order to ease Greece into membership of the EU when it never should have qualified. But what the EU did to Greece was far, far worse than anything that might have happened had Greece kept its independence. We learned from Yanis Varoufakis, the Marxist academic who became Greece’s Finance Minister that as part of its austerity plan, the EU demanded that Greece hike the VAT on its island hotels to 24 percent. Self-evidently this could only harm an economy dependent on tourism — especially when just across the water, Turkish hotels were VAT rated at just seven percent. The EU’s price for bailing out Greece’s bankrupt economy, in other words, was a Carthaginian peace. Greece was to be crushed so utterly that no matter what it did to rejuvenate its economy, no matter how much it cut spending, it could simply never recover. It would languish in perpetuity as the EU’s whipped slave — an example to all the other southern economies (Spain and Italy especially) as to what happens when you are foolish enough to defy Massa. Not unreasonably, the Greek people objected somewhat to this weird arrangement into which they’d been dragged by Tsipras’s socialist predecessor George Papandreou. They wanted out. Instead — just like Warsaw ’44, Hungary ’56, and Tiananmen Square ’89 — the uprising was mercilessly crushed. 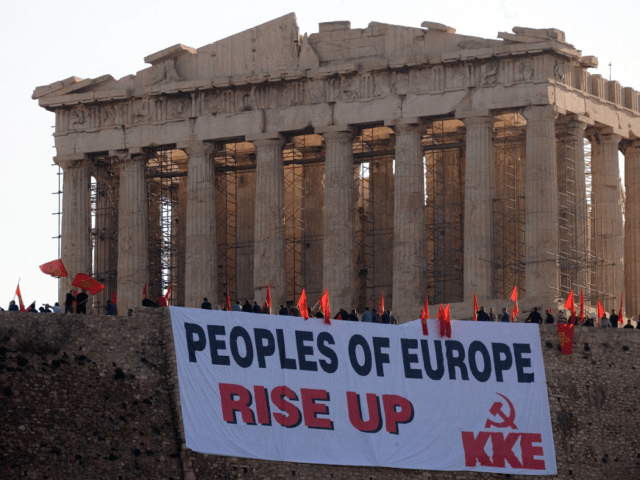 Sure the EU doesn’t dirty its manicured fingers with actual killing — no one wants blood on their Brioni suits — but what its commissars did to Greece was all too redolent of the way ruthless powers such as Rome or Nazi Germany treat conquered states. Greece was forced to sell its government assets. There was talk at one point that it might even be forced to sell the Parthenon — a particularly cruel twist of the knife. It had had its chance to escape — but Tsipras lost his nerve and the country reluctantly acceded. The threat of being driven out of the EU and the Eurozone and becoming what Tsipras called a “failed state” was just too scary for a struggling economy of 9 million people. Somewhere in a parallel universe, I’m writing a piece about the economic miracle of post 2010 Greece; about how, after taking a massive haircut when it crashed out of the Euro and restored the drachma, and after considerable chaos, Greece was now experiencing an extraordinary tourist and export boom — the result of its cheap currency. Yes, Greece had suffered. But the cradle of democracy had got its pride back. Not in this world, unfortunately. Don’t let’s be Greece. Don’t let us ever, ever forget what kind of people we are dealing with here. They’re the kind of people who, when the head of the International Monetary Fund threatens to overturn their plans the man gets conveniently arrested under threat of sexual assault charges; the kind of people who chuckle, self-approvingly, at how they put a sovereign nation in its place by reducing it to penury and satrapy. These people are the Mob. Never get involved with the Mob. And if you’re foolish enough to do so, get out as fast as you can.